Since 1993, Rafiee Ghani has never ceased to amaze the local fine arts scene with his solo exhibitions which included “Room of Flowers” in 1993, “The Painted Garden” in 1996, “The Kebun Sultan” in 2002, “Perfumed Gardens” in 2012, “Desert Rose” in 2014, and his most recent exhibition, “Adventure in Wonderland” in 2017. The exhibition was a visual diary of his month-long solo trip to Morocco in 2012. His works have been acquired by Petronas, Bank Negara Malaysia, Dynasty Hotel and other private collections around the world. Unlike most of his works, the inspiration for “The Garden Outside” was from his hometown in Kelantan. His intimism style, though, is still prominent in this piece. The forest that is no longer there today, was his favourite place to be in. As a child, Rafiee Ghani used to swim in the river with the other children after school. The work depicts a sense of nostalgia, longing, tranquillity and optimism. There is a subtlety to this piece in comparison with his other works. The bold strokes of colour was his way of conveying the brilliance of the local forest filled with natural colours to delight and excite. 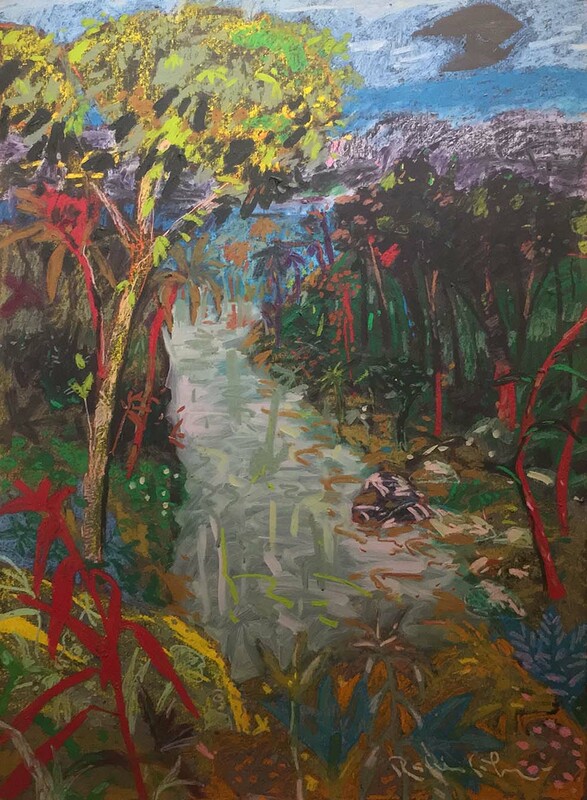 “The Garden Outside” is a piece of Rafiee’s emotional memory that has been immortalised by oil on canvas.